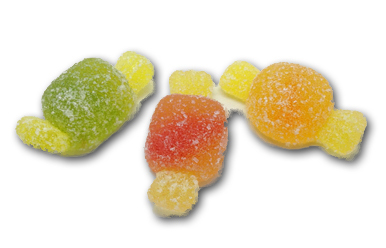 Home » 5 Freshest » Trolli Gummi Bonbons: Sour! Not. 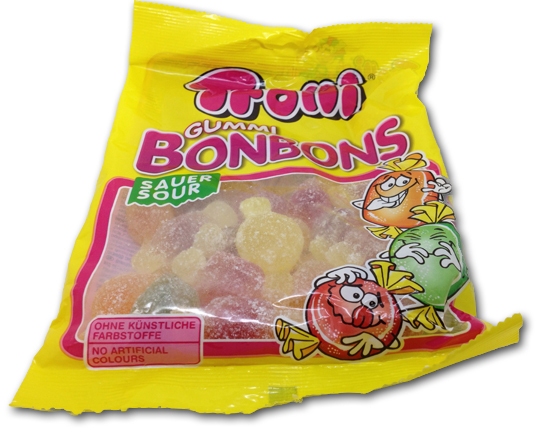 Trolli Gummi Bonbons: Sour! Not. Oh, Trolli. Just when I go singing your praises and talking you up, you give me this? I’m basically in on anything Trolli now, ’cause I’ve been consistently blown away by their offerings available in Germany and the UK. Trolli America however, (no offense here), is an abomination to man. It’s gas station candy-and bad, dank gas station candy at that. Basically, it’s on the no-fly list with me, but again, it’s literally a different company and has nothing to do with real Trolli. So my pal the Suse sends me these, and I’m like… “HELL YES”. Aww. Will ya look at that? Cute little gummy representations of wrapped bon-bons. I gotta hand it to them, these look great and are clever to boot. But…when it comes to taste, these are a gigantic nothingburger. First of all, the bag says sour- and trust me, Trolli can do sour. But these have no relation to sour at all. Nothing. Second issue is that, while not being gross, these just don’t taste like anything. Very muted “general gummy” flavor prevails. Let me put it this way: when my wife and I get the munchies while watching “The Walking Dead” and I open these and they basically remain uneaten? Something’s wrong. ‘Nuff said. I’m thankful you wrote this so I won’t go looking for them.